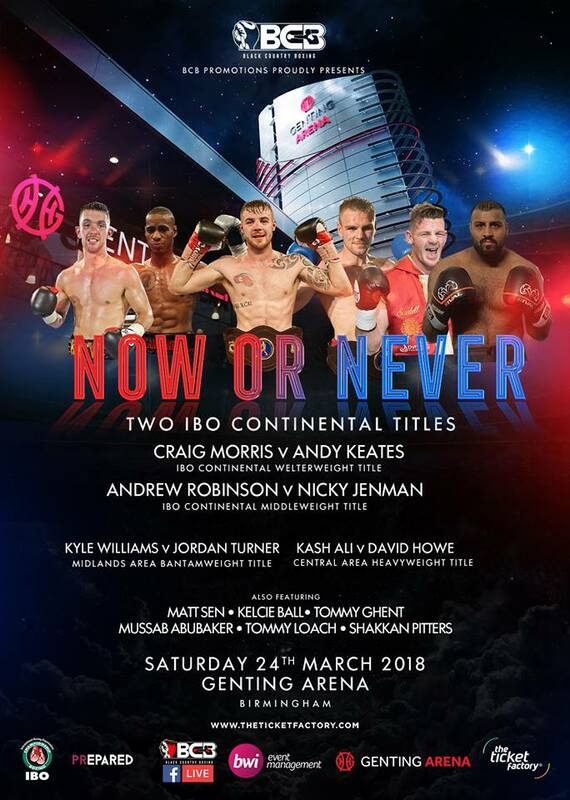 Brighton boxer and former Southern Area middleweight title holder, Nicky Jenman, 31, finally gets a long-awaited shot at a big title on BCB Promotions ‘Now Or Never’ Show at the Genting Arena. Jenman, who turned professional in October 2010 following a sixteen year spell across the junior and amateur divisions has been drafted in to replace Craig Cunningham in a battle with home-town favourite Andrew Robinson. Robinson, 33, and Jenman will fight it out for the IBO Continental Middleweight title tonight just four weeks after Jenman’s last outing, a point’s win over four rounds against Iain Jackson. “It’s bizarre because two years ago I put a status (on Facebook after his Southern Area victory) saying what a dream it would be to challenge for and even win an IBO title,” he said. “Now look what’s happened and I really can’t wait. “It’s like, when I turned pro over six years ago, I said to my dad that I wanted to be able to fight for the Area title, that was the dream, not win it, just to challenge for it. Opposing Robinson is a challenge for Jenman but one he feels is winnable. Having sparred with Chris Eubank Jnr in the past, and opposed the likes of Jack Arnfield, Max Maxwell, Tommy Langford, Grant Dennis, Tom Stokes, all with strong, winning records, then the South Coast southpaw has enough tools in his locker to take care of business. “Don’t get me wrong, this kid is tough,” added Jenman. “But, I’ve had a few messages of support off Frankie Gavin and my work rate and fitness is through the roof. “I know that, going in there in a few weeks’ time, I have to be an annoying, busy bee, frustrate him, and not stand there and trade punches with him.